As chemically and ritualistically dependent on my morning coffee as I am, my weekday routine isn’t ideal. It’s not K-cups or instant coffee, but it wouldn’t win approval from true coffee aficionados. So when my Takeout colleagues and I decided to make 2019 “micro-resolutions,” taking 15 minutes to learn a skill that would improve our culinary know-how (such as expertly chopping an onion), I zeroed in on my morning coffee. I buy quality coffee beans, grind them myself, pre-warm my mug, and own no fewer than four mechanisms for brewing coffee. My favorite method is making pour-overs, but had to admit I wasn’t doing them right. And I have no excuses. My cabinets are full of the requisite equipment: a v60, a gooseneck kettle, a kitchen scale, a digital thermometer. I just never bothered to take the extra few moments to take my pour-over game from a B- to an A+. If I’m going to take the time to brew a pour-over, I resolved, I might as well nail it. Measure water temperature. It should be about 195 degrees Fahrenheit, not boiling, to properly extract the beans’ dissolvable solids, a.k.a. flavor bits. Take the full 3 1/2 minutes to brew. That’s enough time to rinse your filters, “bloom” your grinds, and wait properly between pours of water. Trust the process: weigh, measure, bloom, wait, pour. My results, across three types of coffee beans, were perceptible. Notably, my coffee tasted better black. I usually prefer it with a splash of milk, but I realized that a properly brewed pour-over didn’t have as many rough edges that needed smoothing. There were fewer off-notes to these coffees’ siren songs: no over-acidity, no woody flavor (rinse your filters! ), no harsh astringency. I also realized I’d been using way too much coffee with my eyeball-measurement method, which likely explains my occasional over-exuberance in morning meetings. Third, I now feel more confident in my ability to discern which coffee beans I like and don’t like. Prior to learning a proper pour-over method, I was always unsure whether it was the beans/roast that I didn’t care for, or whether I’d just brewed them improperly. And as for the extra few minutes this method took—worth it. Not only was my coffee more consistently tasty, but the extra minutes were themselves enjoyable. For 201 seconds each morning, I didn’t look at my phone but instead concentrated on the aromas of the brewing coffee, the sound of the liquid dripping into the cup, the gentle tinker of the kettle’s metal lid closing. 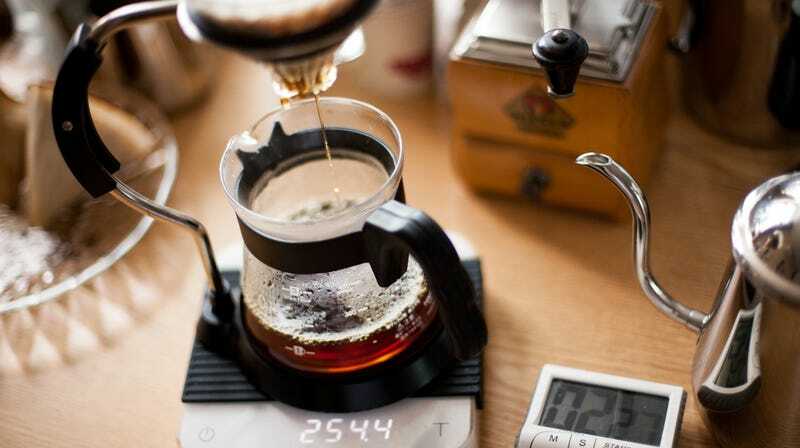 A slow pour-over is not a bad way to begin the day, and it made me think twice about whether I actually needed my customary third morning cup around 10 a.m. Quality over quantity, and fewer jitters, too.